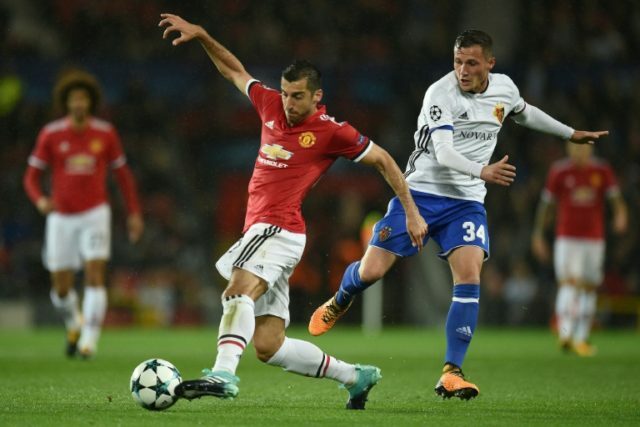 Moscow (AFP) – Trips to Russia have traditionally been seen as complicated assignments for English clubs, but Henrikh Mkhitaryan will have little trouble acclimatising when Manchester United visit CSKA Moscow this week. “My grandmother is from Moscow. I spoke a lot of Russian with her at home,” Mkhitaryan told the Shakhtar Donetsk website in 2013. “The game of my life was last season’s Europa League final,” he said. Mkhitaryan had missed United’s win over Southampton in the League Cup final through injury and his goal-scoring turn against Ajax supplied a golden end to what had initially been a difficult maiden campaign. A £26 million ($35.2 million, 29.5 million euros) signing from Dortmund, he made his first start in a high-stakes derby against Pep Guardiola’s Manchester City at Old Trafford in early September. He did not return to the starting XI until early December and it was not until the season’s second half that he became a first-team fixture. His decisive Europa League displays had the triple effect of cementing his place in the team, charming United’s fans and helping the club secure a return to the Champions League. Now he is a central figure, his surging runs a thrilling component of United’s play, and with five assists in his first six Premier League games, he has already comfortably surpassed his tally of one from last season. But Mkhitaryan is the only member of that quintet to have started all six of United’s league games to date and with Paul Pogba currently injured, his creativity is now even more important to manager Jose Mourinho. “He understands me and, to be honest, I understand him,” Mourinho said last month. “In the beginning of last season, if he understood me better, then he would have started better. But, at the same time, if I understood him better, I would probably have helped him in a faster way than I did. “We spent our time together, working together, learning (about) each other.